Happy Birthday, Bagginses ~ Sept. 22, 2011. What better way to celebrate The Birthday than with [manipped] photos by the late, great Pierre Vinet and a new poem from jan-u-wine. 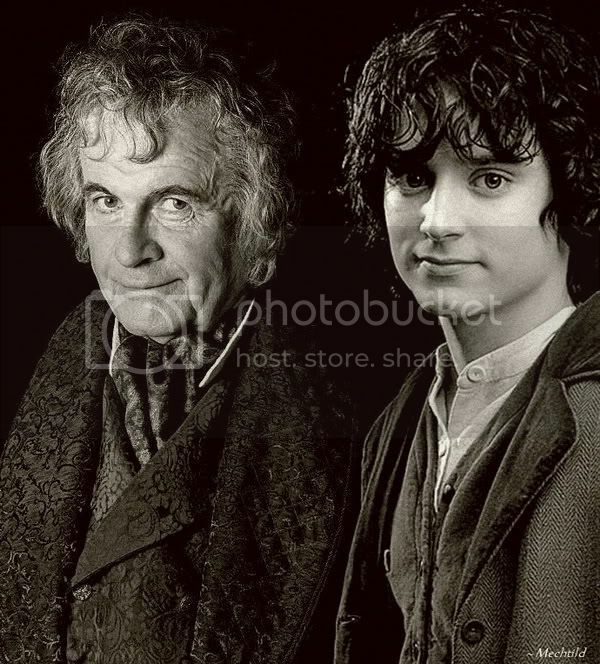 Happy Birthday, dear Bilbo and Frodo, our most beloved Bagginses. within the dips and ditches of the road). The Hill of Home, with illustrative paintings by Thomas Atkinson Grimshaw and Edwin Henry Landseer. Thank you, ladies! How lovely. You are welcome, Shirebound. Cheers! So glad you enjoyed. Thank you! I'll be raising a glass in their honour tonight! As did I even though it was only water. I silently said to them, "May God continue to bless me with your presence in my life". Thank you, dear Antane! glad you enjoyed. Glad you liked it, Paulie. And isn't that the best icon you have there. Is that writing in the background? I can't tell what it says, can you? thank you, Paulie, thank you! Great pics to put together--they sure do like like relations in those pics--something in the expressions. I love that image--just gorgeous! I love what you've imagined, Lavender. And your icon is perfect for the occasion as we raise and clink our mugs in celebration! What a wonderful post.. the picture is stunning and the poem divine. Thank you ladies both. You are too welcome, Bellewood. Thank you for stopping in! thank you so much, Bellewood! I'm very happy you enjoyed. Awww! We still remember them and raise a glass. Thanks for sharing this, friend! Truly so lovely and haunting. The manip is truly gorgeous. Verangel, your gifts are without price, too - your thinking, feeling comments. Thank you. Dear Verangel.....it's such a joy to be able to be in the company of those who feel and appreciate so vividly. Thank you!